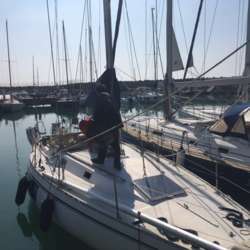 We are back again for the sailing lessons with the purpose to have an interest by you for the next basic courses or cruise days for the next summer season. We will teach to the attendees wishing to learn , the basic principle of seamanship and navigation some maneuvering and knots as well, this lesson will be in English language as well. An aperitif will be served after the lesson . We are also looking for having another sailing boat in order to sail together as fleet . The cost of this sailing event is 50 € including aperitif. Please note that it is required to have the confirmation by all attendees two days, before within Friday 15th. THIS EVENT CAN BE POSTPONED OR CANCELLED IN CASE OF ADVERSE WEATHER CONDITIONS OR TECHNICAL PROBLEMS.